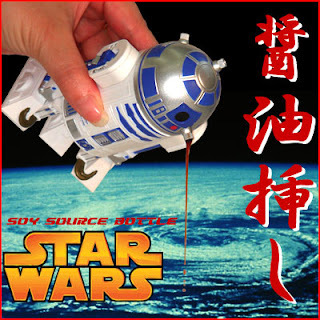 A Rinkya Blog: R2-D2 Soy Sauce Pourer- Star Wars Fans Rejoice! R2-D2 helps you eat your Sushi with this special soy holder for Star Wars fans. Also available are R2-D2 pepper mills, shampoo bottles, and a dust box. R2-Q5, the dark version of R2-D2, also makes an appearance. Only 1725 yen with tax!